Jump on board with the many cities that are taking recycling to another level. Did you know that 5 % of landfills are filled with clothing and shoes? 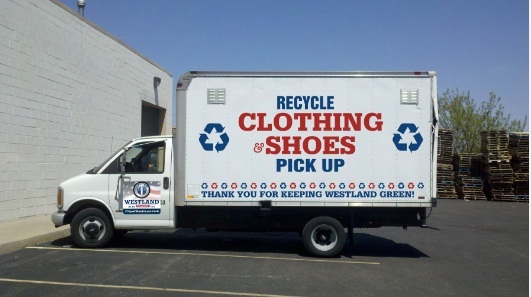 Cities nationwide are becoming pro-active with recycling clothing and shoes and giving their residents a place where they can drop off all un-wanted items. We supply clothing containers with your city logo and information on it. You supply locations where containers are easily accessible for city residents. City Recyclers will collect items from each container on an as-needed basis, recycle, sort, package, and sell the product and share revenue with your city. The higher the volume collected the higher revenue for your city. City Recyclers will cooperate with the existing charity organizations in your cities for the benefits of all parties. According to the statistics presented on www.eartheasy.com, 12 million tons of textile waste is generated each year in North America amounting to approximately 68 pounds of textile waste per household per year! An astounding 5% of all landfill production is textile waste. So, what can we do as individuals to help reduce this environmental impact? The Council for Textile Recycling also reports that the clothing recycling industry prevents 2.5 billion pounds of post-consumer textile waste from entering our landfills and waste stream each year. On a national basis, this industry recycles approximately 10 pounds per capita or 1,250,000 tons of post-consumer textile waste annually. However, these 10 pounds represent less than 25% of the total post-consumer textile waste that is generated.